Looking for a fun twist on a classic chocolate cookie? 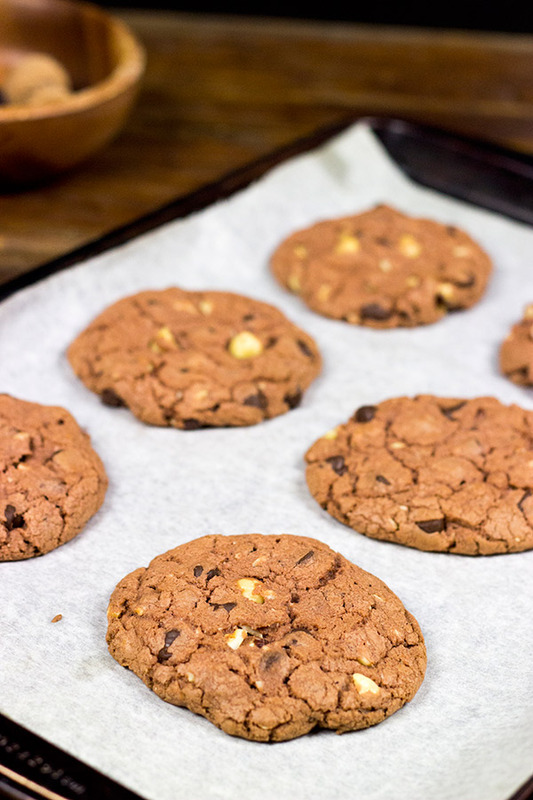 Try these Dark Chocolate Chip Hazelnut Cookies! What’s up with the hazelnut? I feel like it’s the least respected of all nuts. It’s the nut that always got picked on as a kid. It’s the nut that got picked last for playground kickball. Well, I’m on a personal mission to fix that. The hazelnut has grown up and is showing all of the other nuts who’s the boss. These Dark Chocolate Chip Hazelnut Cookies are delicious, and a batch of these cookies needs to be in your kitchen in the near future! My first trip to Italy is when I remember discovering Baci chocolates. These little bites are totally delicious, and I think I ate my weight in them while I was there. (Baci is Italian for “kiss,” by the way.) These little treats are a mix of chocolate and chopped hazelnuts with a whole hazelnut on top. As it turns out, Baci are fairly common in the United States, and I’ll often pick up one or two as a special treat. In fact, when I was first dating my future wife, I gave her a box of Baci for our first Valentine’s Day together. It was difficult to part with an entire box…but I justified it since I kinda liked her. (Ok, I really liked her.) Anyways, back to the point of this story…hazelnuts. 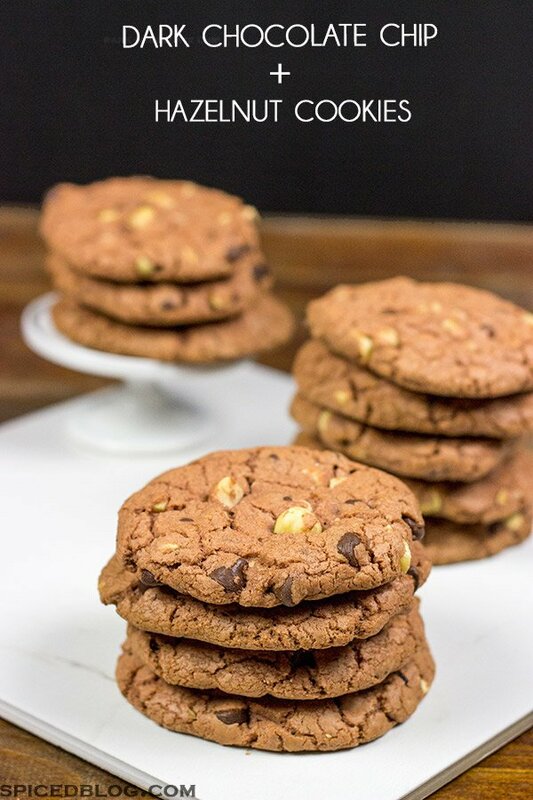 My appreciation for these nuts goes way, way back, so it should come as no surprise that hazelnuts made their way into these delicious Dark Chocolate Chip Hazelnut Cookies. Disclaimer: A few hazelnuts were harmed in the production of these cookies. (By harmed, I mean eaten.) It’s a small price to pay to help move hazelnuts to the front of the kickball line. Before we get to the recipe, can we talk about food holidays? Not like grilling recipes around July 4th and Labor Day, or cookie recipes around Christmas. Nope, actual food holidays. Like the fact that March 5 is National Cheese Doodle Day (true story) or that December 25 is National Pumpkin Pie Day (isn’t that supposed to be on Thanksgiving?). Well, if you haven’t checked your handy food calendar yet today, then you’re in for a real treat. Today is National Grab Some Nuts Day. Really? Yes, really! Could there be a better named food holiday? I think not. In honor of National Grab Some Nuts Day, I joined up with some other awesome foodies to post nut-inspired recipes. Check out their posts below and get inspired. Then go ahead and grab some nuts and start the celebrations! Using a countertop mixer with the paddle attachment, cream together the butter and shortening on medium speed for 2 minutes. Add sugar and mix on medium speed for 1 minute, or until well combined. Add egg and pudding mix, and mix on low speed until fully absorbed. In a small bowl, mix together the flour, baking soda, cornstarch, and salt. Add half of this dry mixture to the mixing bowl and mix on low speed until well combined. Add the remaining dry mixture and mix until combined. Add the chocolate chips and hazelnuts and mix on low speed until combined. Shape the dough into 2” balls and place on a parchment-lined baking pan. Gently press each cookie with your hand until it flattens out slightly. Bake at 375° for 12-13 minutes or until the edges of the cookies turn light brown in color. See post for tips on how to easily toast hazelnuts. 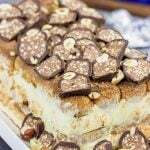 I adore hazelnuts! My theory on why they’re the ugly stepchild of nuts is because of the name. The name “Hazel” is old fashioned and sort of stuffy. Reminds me of a crotchety school teacher or librarian. Nobody likes those people… oh wait…. we LOVE teachers and librarians. OK, I’m clueless. Let’s grab our nuts and have some cookies! What’s up with Chris talking about nuts all the time. He’s fixating a bit too much imo. Mmm I have only baked cookies with hazelnuts in them once. Evidently I need to change that. You totally do, Erin! Hazelnuts are SO underrated!! I am so intrigued by your recipe! 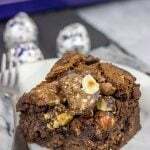 I am going to head out to find hazelnuts because I have dark chocolate chips and who can resist a good nutty chocolate chip recipe?!?!? I have to admit that I’d never had Hazelnuts in cookies but I love dark chocolate so this is the place to start! I’d have no trouble making a stack of these beauties disappear! What an irresistible cookie!!! I’m sorry you had to harm your nuts to make these cookies, but they do look worth it. 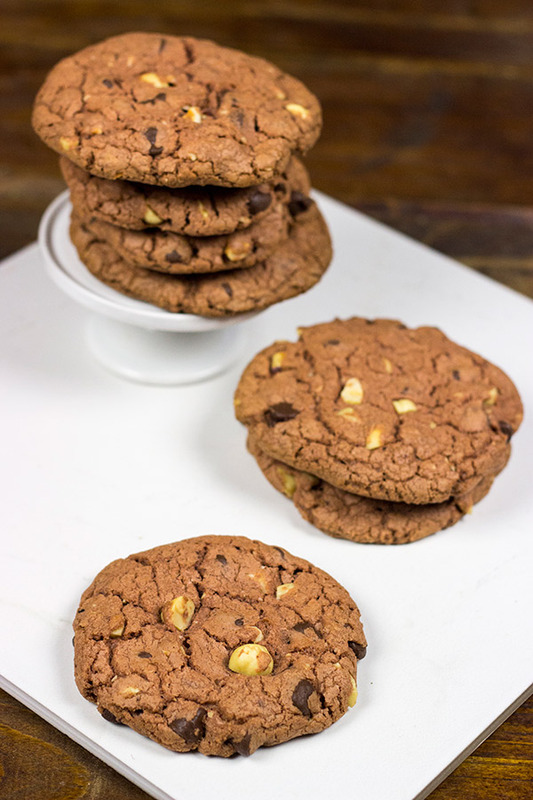 I love hazelnuts in a cookie and make one from Giada all the time, I will have to try yours next time I have a hankering for hazelnuts!! For sure, Tara! These are definitely a go-to recipe around our house whenever we need a batch of yummy cookies. The hazelnut never gets enough love!! Ok I will stop with the teasing – these cookies look amazing – I am too chicken to mess with skinning hazelnuts, but I am not too chicken to tackle a whole dozen of these! Woo! Yes, I blame Becca! She’s always trying to get me in trouble! And as far as those Baci…that’s totally how I got her to say yes. I’m not even pretending anymore…chocolate is the way to a woman’s heart! And hazelnuts help a little bit, too. BTW, don’t be afraid of skinning the hazelnuts…it’s really not a hard process at all! Plus, the hazelnuts need a little love! 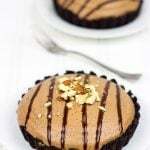 Hazelnut and chocolate is one of my favourite combinations. These sound really good. Great recipe! I love hazelnuts. I buy them for recipes then end up eating them all. They are my weakness. Side note, my gramma’s name was Hazel. I know right. Thanks so much for joining us for this event. It was so much fun getting ready for this. I laughed way too hard at everyone’s comments in the FB group. No problem at all, Kim! I had a blast with this one. It’s always fun to mix in some wacky stuff like this from time to time…especially when nuts are involved! Yes!! I love love hazelnut and really don’t appreciate it when people disregard it in things I make. Thank you for this important fight! Hazelnuts need to be respected more lol! But can I respect them after I gobble down these cookies? Ok thanks! P.S. I was almost in your area of the state yesterday. We went over to the Saranac Brewery…amazing tour! Besides the awesome combination of chocolate and hazelnuts, these look like the perfect cookies! ooh i am so craving one of these cookies right now.. definitely could devour quite a few, they look delicious! Haha…I’ll send you a batch, Thalia!! Can I use walnuts instead of hazelnuts? Hey Renee! You absolutely could use walnuts instead of hazelnuts. That would be a delicious cookie! !